#TGfU Games PE Price Drop & #Basketball PE Release Special! Last weekend before back to school. Firstly, I hope you all had a fantastic holiday season! Secondly, I wanted to announce a couple of specials coming up on Friday, January 4th, 2013! 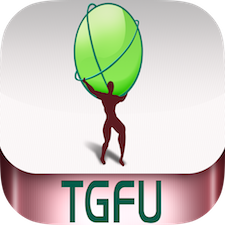 1) TGfU Games PE will experience a price drop from $1.99 to $0.99 in the App Store for iOS devices and will last for the entire weekend, beginning Friday, January 4th (12:00 AM EST) and ending Monday, January 7th (12:00 AM EST). Perfect opportunity to gear up and pack 200+ games at your disposal for use in physical education and physical activity settings! 2) Basketball PE will officially release Friday, January 4th (12:00 AM EST)! It will include 100+ basketball games once again for use in physical education and physical activity settings. Some key features include categorized lessons, growing database of games, quick and easy search capabilities, QR code demonstrations, and knowledge testing through interactive quizzes! Finally, in conjunction with the release of my 2nd application (Basketball PE), I will be holding a draw for free copies of the app through Twitter (@GraciousWolf_PE) twice in a 24 hour period to provide equal opportunity for all areas across the globe! I will post a tweet [RT to enter draws!] on Friday, January 4th at 12:00 am and once again at 12:00 pm. The first draw will last from 12:00 am – 10:00 am (winners announced at 11 am). The second draw will last from 12:00 pm – 10:00 pm (winners announced at 11 pm). Once more, happy holidays and welcome to back to school!